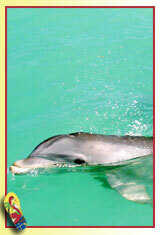 Enjoy the Top Dolphin tours in Key West and save up to 30%. Compare and choose from our Dolphin Encounter, Dolphin Shipwreck and snorkel, or our exclusive Glassbottom - Snorkel - & Dolphin Encounter. Largest selection and Low price guarantee! Come meet our friendly dolphins in the water or on the dry docks at Hawk's Cay Resort! Amazing interaction encounters for resort & non-resort guests. One of our biggest missions is inspiring conservation of natural resources & making dreams come true! See dolphins in the wild! Only 6 passengers. Snorkel among fish, sea turtles, starfish, rays.Includes snorkel equipment, soft drinks, water, fresh fruit & snacks. Marine Mammal Adventure Park. Eco tours, swim with Dolphins, Sea Lions, and Sting Rays plus, other programs in beautifully landscaped setting. Reservations required for swims. Come Share Our Adventure!